MONTREAL – The president of the State Oil Company of Azerbaijan (SOCAR), Rovnag Abdullaev, has announced that the US$8 billion-plus Trans-Anatolian Gas Pipeline may be expanded four-fold from its initially planned volume of 8-16 billion cubic meters per year (bcm/y) to as much as 60 bcm/y. SOCAR will build the pipeline (known by the acronym TAGP and also TANAP from its initials in Turkish) from the Georgian-Turkish border to the Turkish-Bulgarian border, with the participation of the Turkish firms BOTAS and TPAO. The initially estimated cost for its construction was $5 billion, but this has already risen informally to $6-8 billion, and the final cost will be known only after the conclusion of the actual construction contracts. Abdullaev’s statement represents new formal support for the Trans-Caspian Gas Pipeline (TCGP) project to transport natural gas from Turkmenistan under the Caspian Sea to Azerbaijan and onwards to Europe. The European Union has been participating in talks towards this end jointly with Turkmenistan and Azerbaijan, and has stated its readiness to purchase 30 bcm/y from Turkmenistan. That is the volume usually cited as necessary to make the TCGP commercially viable. For its part, Turkmenistan has stated its readiness to sell up to 40 bcm/y. According to Abdullaev, however, it is only “after the EU and Turkmenistan agree” that Azerbaijan can “think of which territory can be allocated for transit”. According to RT, “There’s no stopping South Stream.” As of yesterday, Turkey has approved the $20 billion natural gas pipeline’s progress through its territorial waters in the Black Sea. Meanwhile, Nabucco, the proposed alternative pipeline (supported by the US and EU, concerned about Russian energy dependency), hovers around $33.7 billion—with considerable complications. After receiving permission to build South Stream on Wednesday, Gazprom said two long-term gas supply contracts with Turkey would be extended to 2021 and 2025 and pledged to increase deliveries to Turkey in 2012. Turkey told Gazprom in October it would halt imports of Russian gas through a pipeline across Ukraine, Romania and Bulgaria after failing to agree a discount on supplies. In return Gazprom has granted Turkey’s state gas importer Botas a discount on the gas it buys through contracts for 8 bcm a year and 16bcm/yr, and has agreed to an easing of take-or-pay commitments on the contracts, he said confirming that the level of discount is not being made public. 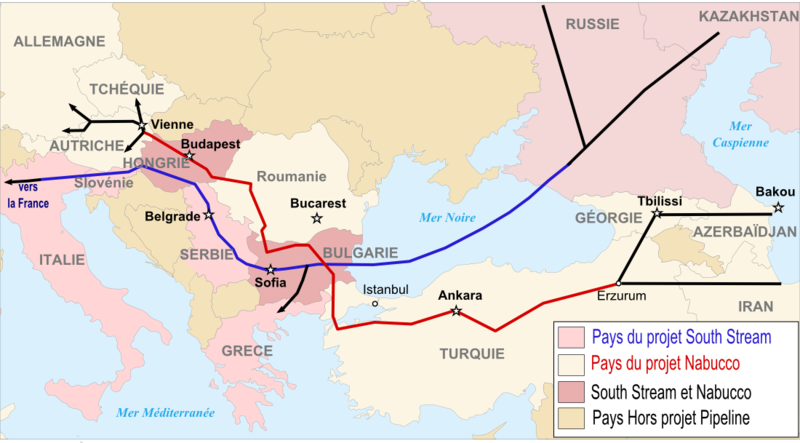 Lest we forget Turkey’s own dependence on Russian energy.